Liverpool manager Kenny Dalglish defended his club's supporters after Manchester United defender Patrice Evra was barracked throughout the FA Cup fourth-round tie at a hostile Anfield. Reds striker Luis Suarez is serving an eight-match ban for racially abusing United defender Evra in October. Despite Dalglish's pleas for calm before Liverpool's 2-1 win, Evra was a constant target for the home fans. 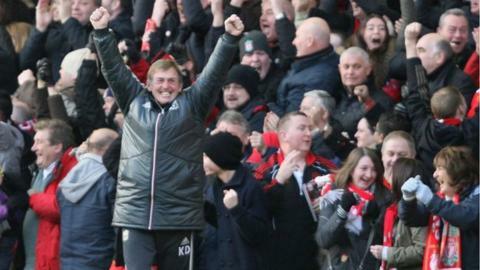 But Dalglish said: "Both sets of supporters were well-behaved." However, Merseyside police's hate crime unit is looking into an alleged incident during Saturday afternoon's match. The Reds boss and United counterpart Sir Alex Ferguson had both urged their supporters to behave ahead of the first meeting between the clubs since the Suarez and Evra race-row. Suarez denied racially abusing Evra during the sides' 1-1 Premier League draw before a Football Association investigation found the Uruguayan guilty of the offence. Evra was booed by Liverpool fans throughout when he touched the ball. Afterwards Dalglish said: "There was a wee bit of banter between both fans which is brilliant because we wouldn't want to take that away. "At the end of the day I thought they were fantastic. The players were a great credit for that as well - none of them tried to do anything other than play football. "The media played its part in going through the process in the week to try and maintain dignity and respect on the football pitch, and concentrate on the football. "That's what they did, that's what the players did and it's what the fans did. The fans are entitled to support their team - absolutely no problem. A bit of banter between two teams - brilliant. "I don't think there was anything there that was untoward." Ferguson also believed the behaviour of both sets of players helped diffuse the situation. He added: "The players showed great respect to each other, there wasn't a bad tackle in the game."